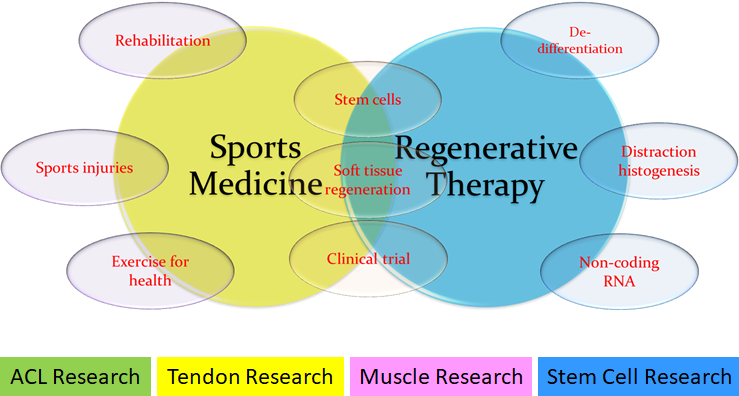 Sports Medicine And Regenerative Therapy (SMART) research theme focuses on translational research to prevent and treat sports injuries, supported by the development of advanced therapy products including stem cells and biomaterials. We have two specialized research teams working together for bench-to-bedside-to-community translational research. The sports medicine research team devises novel treatments and rehabilitation protocols for patients with sports injuries to return-to-play. We also study pathogenesis and injury mechanisms of various sports injuries, and apply this knowledge for injury prevention as well as health promotion by exercise. The regenerative therapy research team investigates basic science of stem cells and strategies to facilitate stem cell therapy. 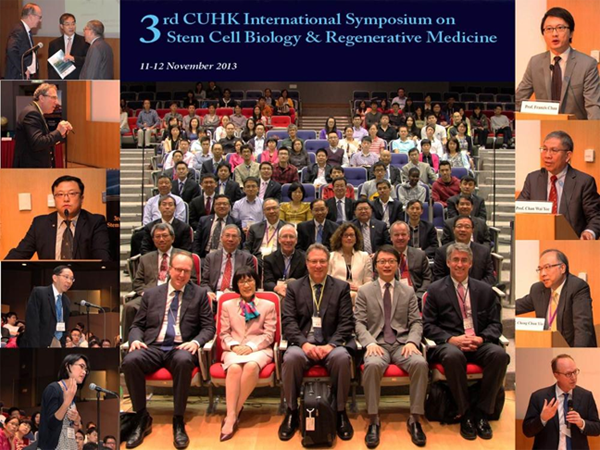 Apart from circulating stem cells and controlled de-differentiation, regulation of tissue regeneration by distraction histogenesis and non-coding RNA are major research directions. In addition to graft healing in anterior cruciate ligament reconstruction (ACLR), we also work on regenerative strategies for tendon, muscle and cartilage. ACL reconstruction (ACLR) can partially restore knee stability , but functional recovery is always compromised by poor graft healing and persistent quadriceps muscle weakness after surgery; while regain of proprioception and psychological readiness during rehabilitation also affect return-to-play. We have investigated various biological enhancements for graft healing and recently proceed to tackle muscle weakness after ACLR. As current assessments of functional recovery after ACLR are not good enough for decision making of return-to play, our applied research team strive to develop kinematic assessments of knee stability with discriminative motion tasks, which will also help to implement preventive training program to reduce risk of ACL injuries in athletes. Bone tendon junction (BTJ) is characterized by a thin layer of fibrocartilage tissue that mediate transition of tendinous to osseous tissues. Natural healing process cannot regenerate BTJ. It is essential to promote timely tenogenic and osteogenic processes to enable reconnection of the anchoring collagen fibres. Crispim JF, Fu SC, Lee YW, Fernandes HAM, Jonkheijm P, Yung PSH, Saris DBF. (2018) Bioactive tape with BMP-2 binding peptides captures endogenous growth factors and accelerates healing after anterior cruciate ligament reconstruction. Am J Sports Med. 46(12):2905-2914. Ghebes CA, Groen N, Cheuk YC, Fu SC, Fernandes H, Saris DB. (2018) Muscle-secreted factors improve anterior cruciate ligament graft healing: an in vitro and in vivo analysis. Tissue Eng Part A. 24(3-4):322-334. Wang J, Xu J, Fu W, Cheng W, Chan K, Yung PS, Qin L. (2017) Biodegradable magnesium screws accelerate fibrous tissue mineralization at the tendon-bone insertion in anterior cruciate ligament reconstruction model of rabbit. Sci Rep. 7:40369. Fu SC, Cheuk YC, Chiu VWY, Yung SH, Rolf CG, Chan KM. (2015) Tripeptide-copper complex GHK-Cu (II) transiently improved healing outcome in a rat model of ACL reconstruction. J Orthop Res. 33(7):1024-33. Lui PP, Wong OT, Lee YW. (2014) Application of tendon-derived stem cell sheet for the promotion of graft healing in anterior cruciate ligament reconstruction. Am J Sports Med. 42(3):681-9. Fu SC, Cheng WH, Cheuk YC, Mok TY, Rolf CG, Yung SH, Chan KM. (2013) Development of vitamin C irrigation saline to promote graft healing in anterior cruciate ligament reconstruction. Journal of Orthopaedic Translation 1: 67-77. Lui PPY, Lee YW, Mok TY, Cheuk YC, Chan KM. (2013) Alendronate reduced per-tunnel bone loss and enhanced tendon graft to bone tunnel healing in anterior cruciate ligament reconstruction. Eur Cell Mater. 25:78-96. Fu SC, Cheng WH, Cheuk YC, Mok TY, Rolf CG, Yung SH, Chan KM. (2013) Effect of graft tensioning on mechanical restoration in a rat model of anterior cruciate ligament reconstruction using free tendon graft. Knee Surg Sports Traumatol Arthrosc. 21:1226-33. Wen CY, Qin L, Lee KM, Wong MW, Chan KM. (2010) Grafted tendon healing in tibial tunnel is inferior to healing in femoral tunnel after anterior cruciate ligament reconstruction: a histomorphometric study in rabbits. Arthroscopy. 26(1):58-66. Wen CY, Qin L, Lee KM, Chan KM. (2009) Peri-graft bone mass and connectivity as predictors for the strength of tendon-to-bone attachment after anterior cruciate ligament reconstruction. Bone. 45(3):545-52. Knee stability is contributed by knee laxity and neuromuscular control. 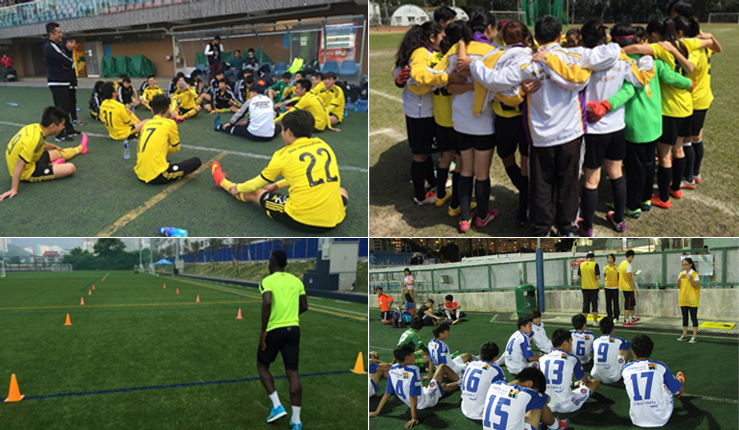 Objective assessment methods are necessary to assist decision making of safe return-to-play. 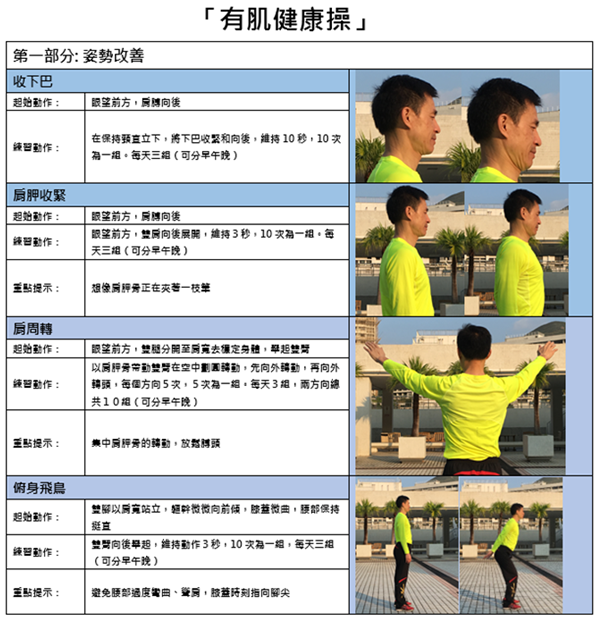 Safeguarding muscle function by implementation of injury prevention programme is also essential. Yeung MY, Fu SC, Chua EN, Mok KM, Yung PS, Chan KM. 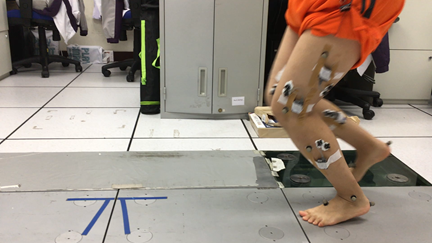 (2016) Use of a portable motion analysis system for knee dynamic stability assessment in anterior cruciate ligament deficiency during single-legged hop landing. Asia Pac J Sports Med Arthrosc Rehabil Technol. 5:6-12. Chua EN, Yeung MY, Fu SC, Yung PS, Zhang Y, Feng H, Chan KM. (2016) Motion task selection for kinematic evaluation after anterior cruciate ligament reconstruction: a systematic review. Arthroscopy. 32(7):1453-65. Fong DT, Lam MH, Lai PK, Yung PS, Fung KY, Chan KM. (2014) Effect of anticipation on knee kinematics during a stop-jump task. Gait Posture. 39(1):75-9. Fu CL, Yung SH, Law KY, Leung KH, Lui PY, Siu HK, Chan KM. (2013) The effect of early whole-body vibration therapy on neuromuscular control after anterior cruciate ligament reconstruction: a randomized controlled trial. Am J Sports Med. 41(4):804-14. Lui PP, Cheng YY, Yung SH, Hung AS, Chan KM. (2012) A randomized controlled trial comparing bone mineral density changes of three different ACL reconstruction techniques. Knee. 19(6):779-85. Lam MH, Fong DT, Yung PS, Ho EP, Fung KY, Chan KM. (2011) Knee rotational stability during pivoting movement is restored after anatomic double-bundle anterior cruciate ligament reconstruction. Am J Sports Med. 39(5):1032-8. Pathogenesis of tendinopathy primarily involves failed tendon healing, in which normal tendon healing process is deregulated under the influences of a number of stressful conditions, which are originated from known risk factors (overuse, diabetes). Our research include analysis of clinical samples, mechanistic studies in cell culture, establishment of representative animal models and evaluation of treatment effects in tendinopathy patients. Rolf CG, Fu SC, Hopkins C, Luan J, Ip M, Yung SH, Friman G, Qin L, Chan KM. (2017) Presence of bacteria in spontaneous achilles tendon ruptures. Am J Sports Med. 45(9):2061-7. Lui PP, Lee YW, Wong YM, Zhang X, Dai K, Rolf CG. (2013) Expression of Wnt pathway mediators in metaplasic tissue in animal model and clinical samples of tendinopathy. Rheumatology (Oxford). 52(9):1609-18. Rui YF, Lui PP, Wong YM, Tan Q, Chan KM. (2013) Altered fate of tendon-derived stem cells isolated from a failed tendon-healing animal model of tendinopathy. Stem Cells Dev. 22(7):1076-85. Rui YF, Lui PP, Rolf CG, Wong YM, Lee YW, Chan KM. 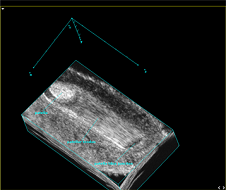 (2012) Expression of chondro-osteogenic BMPs in clinical samples of patellar tendinopathy. Knee Surg Sports Traumatol Arthrosc. 20(7):1409-17. Lui PP, Chan LS, Fu SC, Chan KM. (2010) Expression of sensory neuropeptides in tendon is associated with failed healing and activity-related tendon pain in collagenase-induced tendon injury. Am J Sports Med 38(4):757-64. Fu SC, Rolf C, Cheuk YC, Lui PP, Chan KM. (2010) Deciphering the pathogenesis of tendinopathy: a three-stage process. Sports Med Arthrosc Rehabil Ther Technol. 2(1):30. Lui PP, Fu SC, Chan LS, Hung LK, Chan KM. (2009) Chondrocyte phenotype and ectopic ossification in collagenase-induced tendon degeneration. J Histochem Cytochem. 57(2):91-100. Fu SC, Wang W, Pau HM, Wong YP, Chan KM, Rolf CG. (2002) Increased expression of transforming growth factor-β1 in patellar tendinosis. Clin Orthop Relat Res. (400):174-83. Rolf CG, Fu SC, Pau A, Wang W, Chan B. (2001) Increased cell proliferation and associated expression of PDGFRbeta causing hypercellularity in patellar tendinosis. Rheumatology (Oxford). 40(3):256-61. Scapular dyskinesis is one of the contributing factors to rotator cuff tendinopathy. Scapular muscle deficits have been shown to alter the scapular kinematics and contribute to the reduction of the subacromial space in patients with rotator cuff tendinopathy. 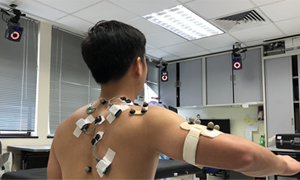 Our research aimed to investigate the effects of scapular-focused exercise programme on scapular kinematics, subacromial space, and shoulder pain and function in patients with rotator cuff tendinopathy. Leong HT, Fu SC, He X, Yung SHP (2018). Risk factors associated with rotator cuff tendinopathy: a systematic review and meta-analysis. 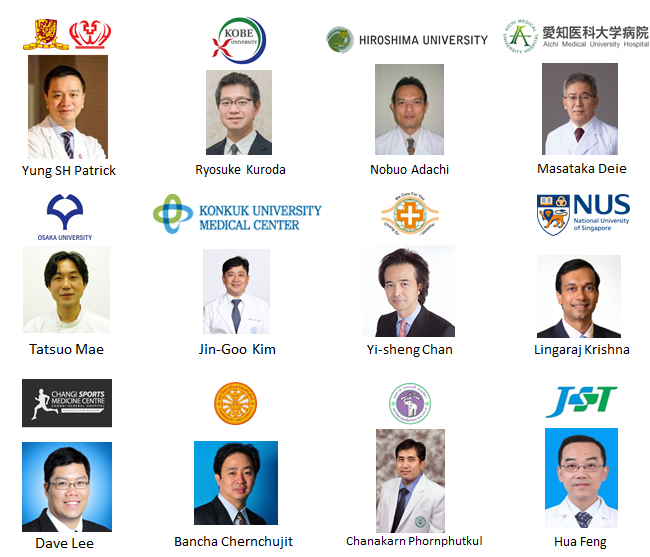 Asia-Pacific Journal of Sports Medicine, Arthroscopy, Rehabilitation and Technology, 13: 17-18. 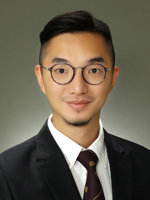 Leong HT, Fu SN (2018). The effects of rigid scapular taping on the subacromial space in athletes with and without rotator cuff tendinopathy: a randomized-controlled study. Journal of Sport Rehabilitation, doi: 10.1123/jsr.2017-0287. Leong HT, Ng GF, Fu SN (2017). Effects of scapular taping on the activity onset of scapular muscles and the scapular kinematics in volleyball players with rotator cuff tendinopathy. Journal of Science and Medicine in Sports, 20(6), 555-560. Leong HT, Ng GY, Chan SC, Fu SN (2017). Rotator cuff tendinopathy alters the muscle activity onset and kinematics of scapula. Journal of Electromyography and Kinesiology, 25, 40-46. Tsui SS, Leong HT, Leung VY, Ying M, Fu SN (2017). Tendon vascularity in overhead athletes with subacromial pain syndrome and its correlation with the resting subacromial space. Journal of Shoulder Elbow Surgery, 26(5), 774-780. 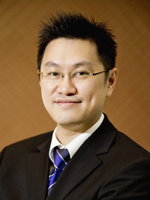 Leong HT, Tsui SSM, GYF Ng, Fu SN (2016). Reduction of the subacromial space in athletes with and without rotator cuff tendinopathy and its association with the strength of scapular muscles. Journal of Science and Medicine in Sports, 19(12), 970-974. Leong HT, Hug F, Fu SN (2016). Increased Upper Trapezius Muscle Stiffness in Overhead Athletes with Rotator Cuff Tendinopathy. PLoS ONE. 2016, 11(5), e0155187. Leong HT, Ng GY, Leung VY, Fu SN (2013). Quantitative estimation of muscle shear elastic modulus of the upper trapezius with Supersonic shear imaging during arm positioning. PLoS ONE, 8(6), e67199. Leong HT, Tsui S, Ying M, Leung VY, Fu SN (2012). 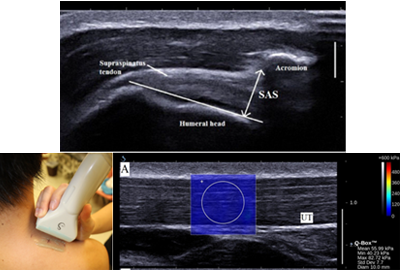 Ultrasound measurements on acromiohumeral distance and supraspinatus tendon thickness: test-retest reliability and correlations with shoulder rotational strengths. Journal of Science and Medicine in Sports, 15(4), 284-291. Tendon injuries are difficult to manage, especially in cases of bone tendon junction healing. With the discovery of tendon derived stem cells (TDSC), we intend to construct an engineered tendon by stem cells and growth factors without exogenous scaffolds. TDSC also play an important role in failed tendon healing in tendinopathy. Tendon stem/progenitor cells, as a new cell type, was firstly identified in both human and mouse tendon tissues in 2007, and we also isolated and characterized this unique stem cell population from rat tendon tissues. We have found that tendon-derived stem cells (TDSCs) have higher mRNA expression of tenomodulin (Tnmd), scleraxis (Scx), type I collagen (Col1A1), decorin (Dcn) and biglycan (Bgn) than that of bone marrow derived mesenchymal stem cells (BMSCs). Our recent study further demonstrated TDSCs could promote earlier and better recovery after tendon injury as a new cell source for tendon repair The ectopic bone formation in tendon after transplantation of MSCs is an unwanted side effect. To avoid this potential risk, we propose that tenogenic differentiation of TDSCs in vitro may promote tendon healing and alleviate the risk of complication such as ectopic bone formation after transplantation of tenogenic TDSCs in vivo. We have successfully constructed engineering scaffold-free tendon tissue using TDSCs cell sheet in vitro,the engineered scaffold-free tendon tissue promoted tendon healing in a rat patellar tendon window injury model. Rui YF, Lui PPY, Li G, Fu SC, Lee YW, Chan KM. Isolation and characterization of multi-potent rat tendon-derived stem cells. 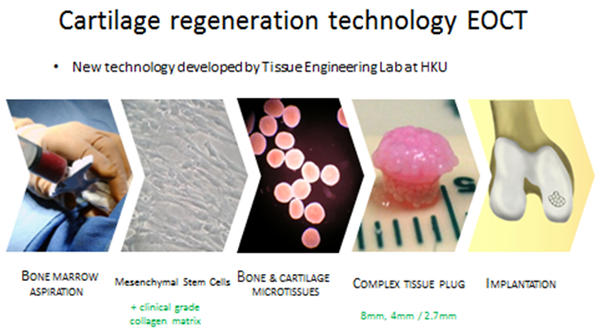 Tissue Engineering Part A, 2010; 16: 1549-1558. Rui YF, Lui PP, Ni M, Chan LS, Lee YW, Chan KM. 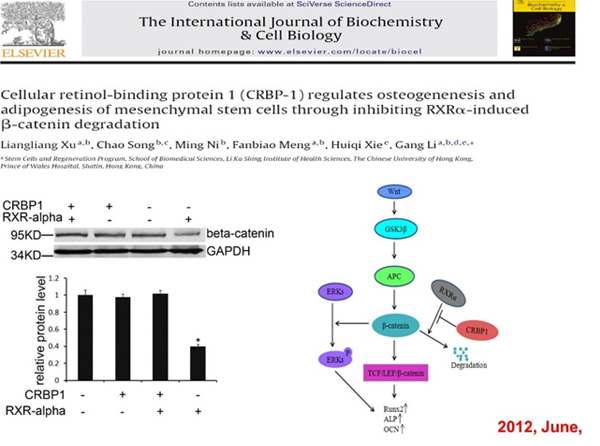 Mechanical loading increased BMP-2 expression which promoted osteogenic differentiation of tendon-derived stem cells. Journal ofOrthopaedic Research, 2011; 29: 390-396. Tan Q, Lui PP, Rui YF, Wong YM. Comparison of potentials of stem cells isolated from tendon and bone marrow for musculoskeletal tissue engineering. Tissue Engineering Part A, 2012; 18: 840-851. Ni M, Lui PP, Rui YF, Lee YW, Lee YW, Tan Q, Wong YM, Kong SK, Lau PM, Li G, Chan KM. Tendon-derived stem cells (TDSCs) promote tendon repair in a rat patellar tendon window defect model. Journal of Orthopaedic Research, 2012; 30: 613-619. Ni M, Rui YF, Tan Q, Liu Y, Xu LL, Chan KM, Wang Y, Li G. Engineered scaffold-free tendon tissue produced by tendon-derived stem cells. Biomaterials, 2013; 34: 2024-2037. Guo J, Zhang J, Li G, Chan KM. A mini-review: microRNA in tendon injuries. J Stem Cell Res & Therapy; 2015, 5:9. Wang B, Guo J, Feng L, Fu WM, Zhang JF, Li G. MiR124 suppresses collagen formation of human tendon derived stem cells through targeting EGR1. Experimental Cell Research, 2016 Oct 1; 347(2):360-6. Liu Y, Xu LL, Wu TY, Sun YX, Xu J, Lee YW, Wang B, Chang HC, Jiang XH, Zhang JF, Li G. CFTR mediates tenogenic differentiation of tendon derived stem cells and tendon repair: accelerating tendon injury healing by intervening its downstream signaling. The FASEB Journal, 2017 Sep; 31(9):3800-3815. Hou YH, Ni M, Lin SE, Sun YX, Lin WP, Liu YM, Wang HB, He W, Li G, Xu LL. Tenomodulin highly expressing MSCs as a better cell source for tendon injury healing. Oncotarget, 2017; 2017 Aug 24; 8(44):77424-77435. Liu Y, Wang H, Wang YJ, Chan HC, Jiang XH, Zhang JF, Li G*. Identification of an anti-inflammation protein, Annexin A1, in TDSCs of cystic fibrosis mice: A comparative proteomic analysis. Proteomics Clinical Applications, 2018 May 21:e1700162. 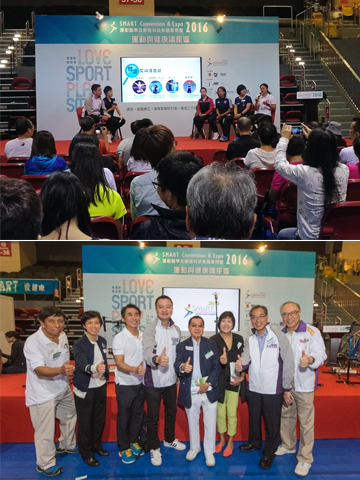 To facilitate our biggest portion of the population to age well in our community, healthy and active lifestyle should be promoted among the young-olds and elderlies, with focus on muscle strengthening. 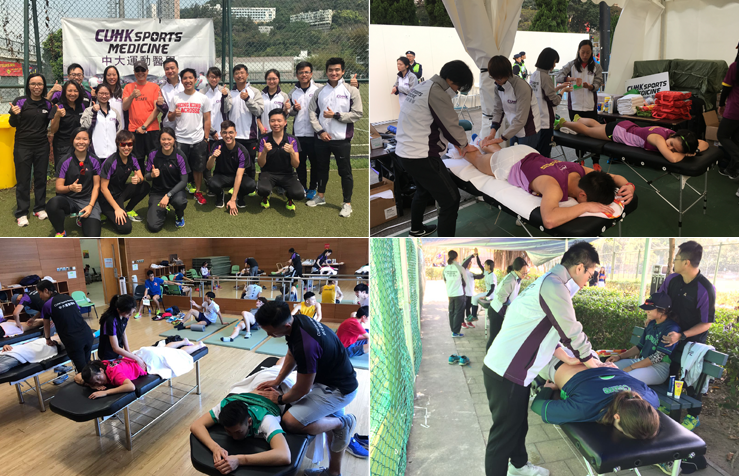 The "Mus-fit Action" health promotion project aims at training Mus-Fit Ambassadors to coach local young olds and elderly to establish habits of regular exercise, hence promote musculoskeletal health. 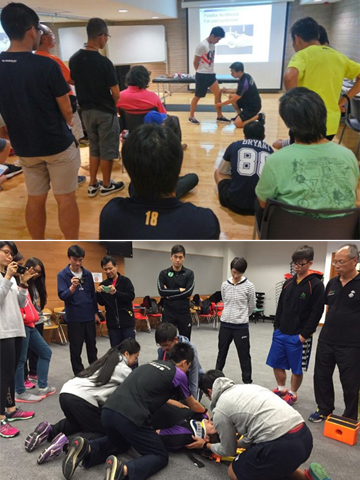 A set of stretching and muscle strengthening exercise is designed and coached by 'Mus-fit' ambassadors. 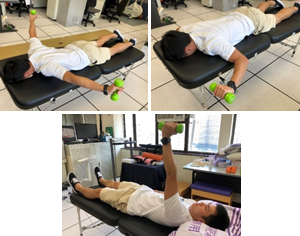 The effectiveness of this exercise training will be evaluated by on-line musculoskeletal health survey and on-site assessment of muscle strength and fitness. Apart from instability and pain, knee injuries commonly result in muscle weakness which is a major obstacle of functional recovery. Arthogenic muscle inhibition (AMI) represents long-lasting inability to fully activate the quadriceps muscle, which is thought to be contributed by joint inflammation, effusion, pain and reflex inhibition. Functional deficits due to AMI may further interact with persistent muscle atrophy which may be attributed to disturbances in myokines. We propose to tackle these clinical conditions of muscle weakness by biological intervention and preventive measures. Gene regulatory mechanisms are crucial in determining cell identity and cell fate. 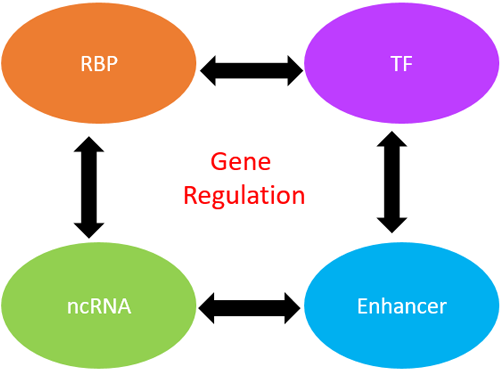 Transcription factors (TFs), Enhancers, non-coding RNA (ncRNAs) and RNA binding proteins (RBPs) are key elements in regulating gene expression at transcriptional and post-transcriptional levels and they remain as the focus of our research. We study gene regulatory mechanisms in the system of adult skeletal muscle regeneration and muscle stem cells. Skeletal muscle has a remarkable ability to regenerate after injury owing to its resident muscle stem cells (also called satellite cells, SCs) which normally lie quiescently beneath muscle fiber. SCs can quickly activate and proliferate following injury, then differentiate and fuse into myofiber; meanwhile a subset of SCs undergoes self-renewal and returns to quiescent state to replenish the adult stem cell pool. Each state of the myogenic lineage progression is orchestrated by complex gene regulatory networks of intrinsic and extrinsic factors/mechanisms. Disruption of the regulations may render their loss of ability to regenerate, contributing to muscle wasting conditions such as muscular dystrophy, cachexia, and sarcopenia that are prevalent in our society. Better understanding of the gene regulatory mechanisms underlying skeletal muscle regeneration through our research will aid future therapeutic development of treatment for muscle damages and diseases. Peng X, So KK, He L, Zhao Y, Zhou J, Li Y, Yao M, Xu B, Zhang S, Yao H, Hu P, Sun H, Wang H. MyoD- and FoxO3-mediated hotspot interaction orchestrates super-enhancer activity during myogenic differentiation. Nucleic Acids Res. 2017 Jun 1. Zhou J, Zhang S, Wang H, Sun H. LncFunNet: an integrated computational framework for identification of functional long noncoding RNAs in mouse skeletal muscle cells. Nucleic Acids Res. 2017 Apr 1. Chen X, He L, Zhao Y, Ly Y, Zhang S, Sun K, So K, Chen F, Zhou L, Lu L, Wang L, Zhu X, Bao X, Esteban MA, Nakagawa S, Prasanth KV, Wu Z, Sun H, Wang H. Malat1 regulates myogenic differentiation and muscle regeneration through modulating MyoD transcriptional activity. Cell Discov. 2017 Mar 14;3:17002. Zhou, L., Sun, K., Zhao, Y., Zhang, S., Wang, X., Li, Y., Lu, L., Chen, X., Chen, F., Bao, X., Zhu, X., Wang, L., Tang, L. Y., Esteban, M. A., Wang, C. C., Jauch, R., Sun, H. & Wang, H. (2015). Linc-YY1 promotes myogenic differentiation and muscle regeneration through an interaction with the transcription factor YY1. Nature Communications. 6:10026. Wang, L., Zhao, Y., Bao, X., Zhu, X., Kwok, Y. K., Sun, K., Chen, X., Huang, Y., Jauch, R., Esteban, M. A., Sun, H., & Wang, H. (2015). LncRNA Dum Interacts with Dnmts to Regulate Dppa2 Expression during Myogenic Differentiation and Muscle Regeneration. Cell Research, 5(3):335–350. Lu, L., Sun, K., Chen, X., Zhao, Y., Wang, L., Zhou, L., Sun, H., & Wang, H. (2013). Genome-wide survey by ChIP-seq reveals YY1 regulation of lincRNAs in skeletal myogenesis. EMBO Journal, 32(19), 2575-2588. With it multipotent differentiation ability, it is of great research interest to investigate and use MSCs for functional tissue engineering. Poor therapeutic outcome is often the hindrance to this cellular therapy. Various attempts have been suggested to enhance the survivability and differentiation ability of MSCs in vivo, but complicated manipulation and foreign genes introduction may elicit another safety concerns. With these, we propose a simple manipulation to enhance the capability of MSCs for tissue regeneration. MSCs have been proven to promote cartilage regeneration in osteoarthritis and chondral defect animal models. However, clinical trials showed that transplanted MSCs in osteoarthritis patients showed poor viability and the chondrogenic differentiation ability is still controversial. Previous study showed that two-phases differentiation procedure (de-differentiation) promoted survivability and differentiation potential of MSCs (illustrated below). With this, we aim to investigate if this de-differentiation process is also to promote the chondrogenic or osteogenic differentiation of MSCs and its survivability in vivo. We proved that chondrogenic de-differentiated MSCs (De-chondro-MSCs) is more resistant to cytotoxic agent and showed higher chondrogenic differentiation than untreatead MSCs in vitro. Moreover, De-chondro-MSCs exhibited higher cell survivability and better cartilage regeneration in vivo. With these, we demonstrated that de-differentiation process could be an effective alternative to promote the clinical application of MSCs in tissue regeneration. Lin SE, Lee WYW, Xu LL, Wang YJ, Chen YF, Ho KW, Qin L, Jiang XH, Cui L, Li G. Stepwise preconditioning enhances mesenchymal stem cell-based cartilage regeneration through epigenetic modification. Osteoarthritis and Cartilage; 2017 Sep;25(9):1541-1550. (IF:4.6). Mesenchymal stem cells (MSCs) have been found in cord blood and peripheral blood (PB) of mammalian species including human, guinea pig, mice, rat, dog, horse and rabbit. The number of MSCs in PB (PB-MSCs) is rare and their biological role was not fully defined. PB-MSCs are new cell source of cells that may play very important roles in development, repair and disease progression. PB-MSCs may be used for disease monitoring, diagnosis, cell and gene therapy applications. We have found increased numbers of circulating MSCs in peripheral blood in patients with long bone fracture, non-union and in patients with cancers. The number of PB-MSCs was approximately 9 times higher in the cancer patients, suggesting there is systemic recruitment of MSCs during cancer development. We have compared the difference between the circulating MSCs and bone marrow derived MSCs and found that they share similar phenotype in vitro, but the gene expression profile between the two cell populations was significantly different. cDNA microarray analysis and quantitative RT-PCR confirmed some genes that are differentially expressed with more than 10 folds difference, such as cellular retinol-binding protein 1 (CRBP1), N-cadherin, SRY-box containing gene 11 (Sox11), the aquaporin 1 (AQP1), et al. These genes are now being further investigated for their role in MSCs migration, homing and multiple-differentiation potential. We have demonstrated that systemically administrated MSCs could home to tumor sites and participated tumor growth. 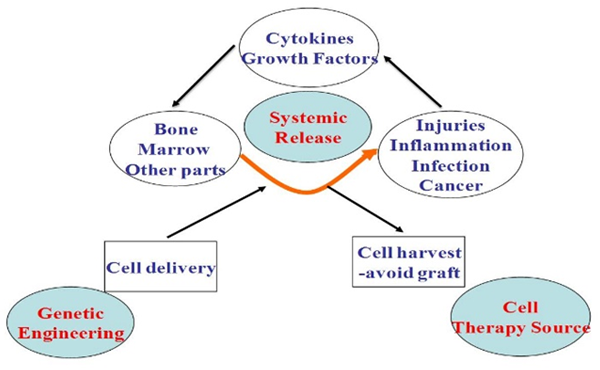 We are now working on using MSCs as a systemic gene delivery vehicle for management of wound healing and cancer therapy, and the ways of enhancing the homing and recruitment of MSCs toward specific sites after their systemic delivery. Xu LL, E SM, Lin S, Hou YH, Lin WP, He W, Wang HB, Li G. Sox11-modified mesenchymal stem cells accelerate cartilage defect repair in SD rats. Cell & Tissue Research, 2108, in press. Xu LL, Liu YM, Sun YX, Wang B, Xiong YP, Lin WP, Wei QS, Wang HB, He W, Wang B, Li G. Tissue source determines the differentiation potentials of mesenchymal stem cells- a comparative study of human mesenchymal stem cells from bone marrow and adipose tissue. Stem Cell Research & Therapy, 2017 Dec 6; 8(1):275. 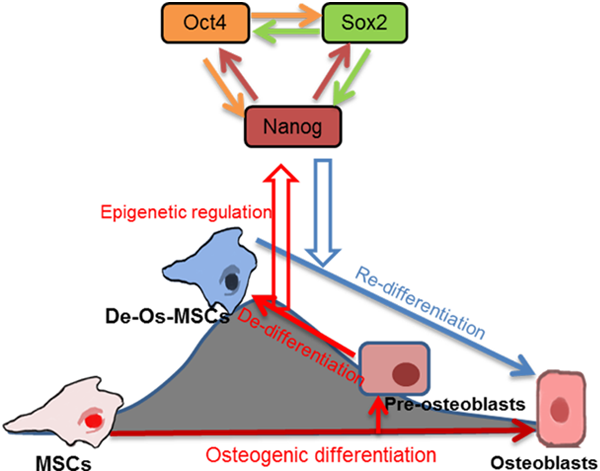 Meng FB, Xu LL, Huang S, Liu Y, Hou YH, Wang KX, Jiang XH, Li G. Small nuclear ribonucleoprotein polypeptide N (Sm51) promotes osteogenic differentiation of bone marrow mesenchymal stem cells by regulating Runx2. Cell & Tissue Research, 2016 Oct;366(1):155-62. 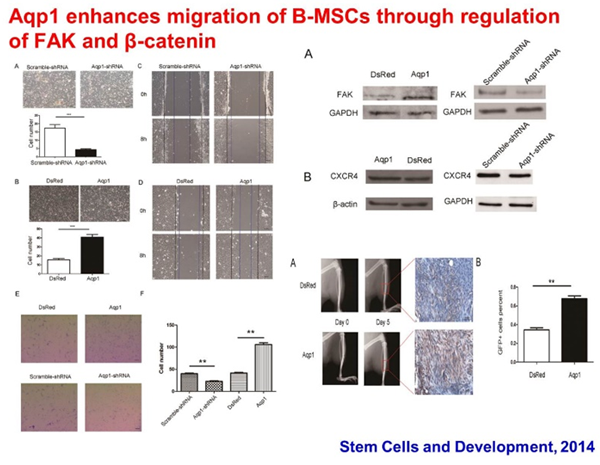 Xu LL, Wan C, Jiang XH, Li G. Aqp1 enhances migration of bone marrow mesenchymal stem cells through regulation of FAK and ß-catenin. Stem Cells and Development, 2014; 23(1):66-75. 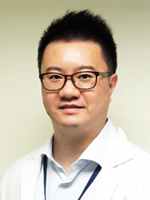 Lee WYW, Zhang T, Lau CPY, Wang CC , Chan KM, Li G. Immortalized human fetal bone marrow-derived mesenchymal stem cell expressing anti-tumor suicide gene for anti-tumor therapy in vitro and in vivo. Cytotherapy, 2013; 15: 1484-1497. 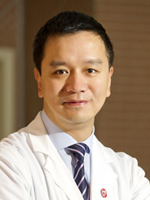 Zhang T, Lee YW, Rui YF, Cheng TY, Li G. Bone marrow-derived mesenchymal stem cells promote growth and angiogenesis of breast and prostate tumors. Stem Cell Research & Therapy, 2013, 4:70 doi:10.1186/scrt221. Meng FB, Liu XY, Li HT, Pang XN and Li G. Regulation of blood glucose by administration of allogenic bone marrow derived mesenchymal stem cells into diabetic rats through modulating regeneration of both α and β islet cells. Journal of Diabetes Research & Clinical Metabolism, 2013; 2:1 (DOI: http://dx.doi.org/10.7243/2050-0866-2-7). Zhang XB, Meng XM, Baylink D, Neises A, Kiroyan J, Su RJ, Kimberly P, Gridley D, Wang J, William KH, Lee W, Li G. Rapid and efficient reprogramming of human fetal and adult blood CD34+ cells into mesenchymal stem cells with a single factor. Cell Research, 2013; 23(5):658-72. Distraction histogenesis (DH) techniques have been widely accepted and practiced in orthopaedics, traumatology, and craniofacial surgery over the last two decades, using DH methods, many previously untreatable conditions have been successfully managed with outstanding clinical outcomes. 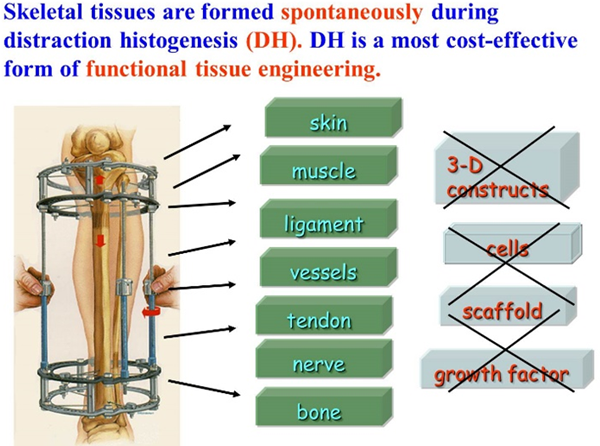 Although the biological mechanisms of DH are still not yet fully defined, it is generally accepted that mechanical stimulation is the key in promoting and maintaining tissues' regenerating capacities. Many genes are up- or down-regulated in bone cells responding to mechanical stimulation. 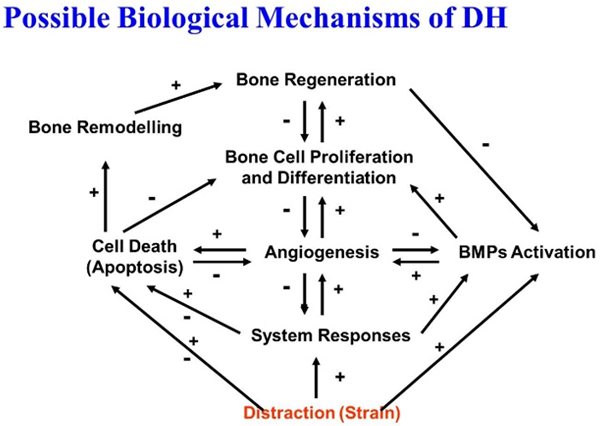 The changing patterns of BMPs expression and apoptosis may regulate bone regeneration in DH. High magnitude strain promotes bone remodelling, whereas low magnitude stain stimulates osteogenesis. DH not only increases local angiogenesis, but also leads to increased expressions of VEGF and its receptors systemically. Routine radiography remains the most cost effective imaging technique to follow all aspect of the regenerate, followed by ultrasound, mechanical testing, DEXA and QCT. Under normal circumstances with adequate support of postoperative physiotherapy, DH treatment has good clinical outcome and needs no additional intervention(s). However, if bone consolidation becomes a clinical concern, minimal non-invasive means of intervention for promoting bone consolidation are preferable, such as weight-bearing exercise, ultrasound and electromagnetic stimulation. Systemic administration of anabolic agents and hormones may also be useful and local application of growth factors such as BMPs remains the last resort, as their working mechanisms in DH are still not clearly known and are expensive. Xu J, Sun YX, Wu TY, Liu Y, Shi L, Zhang JF, Kang QL, Chai YM, Li G. Enhancement of bone regeneration with the accordion technique via HIF-1α/VEGF activation in a rat distraction osteogenesis model. Journal of Tissue Engineering and Regenerative Medicine, 2017 Aug 1. doi: 10.1002/term.2534. Sun YX, Zhang JF, Xu Jia, Xu LL, Wu TY, Wang B, Pan XH, Li G. MicroRNA-144-3p inhibits bone formation in distraction osteogenesis through targeting Connexin 43. Oncotarget, 2017; 8:89913-89922. 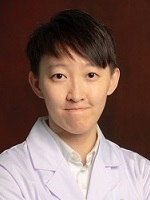 Yang Y, Lin S, Wang B, Gu W, Li G. Stem cell therapy for enhancement of bone consolidation in distraction osteogenesis: A contemporary review of experimental studies. Bone Joint Research, 2017 Jun; 6(6):385-390. 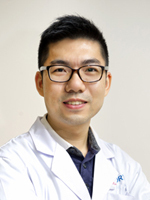 Xu J, Wang B, Sun YX, Wu TY, Liu Y, Zhang JF, Lee WYW, Pan XH, Chai YM, Li G. Human fetal mesenchymal stem cell secretome enhances bone consolidation in distraction osteogenesis. Stem Cell Research & Therapy, 2016; 7(1):134. Ilizarov 技术骨科应用进展。 秦泗河，李刚主编。 人民军医出版社， 北京， 2014.1 (ISBN 978-7-5091-7054-4) (120 万字). Development and application of Ilizarov technology in orthopaedic surgery. Qin Sihe and Li Gang (Editor). People's Military Medical Press, Beijing, 2014. 01 (ISBN 978-7-5091-7054-4). 实用骨外固定学。 夏和桃主编。 彭爱民， 刘利民，李刚， 秦泗河副主编。 人民卫生出版社， 北京， 2013 (ISBN 978-7-117-17408-4) (202万字). 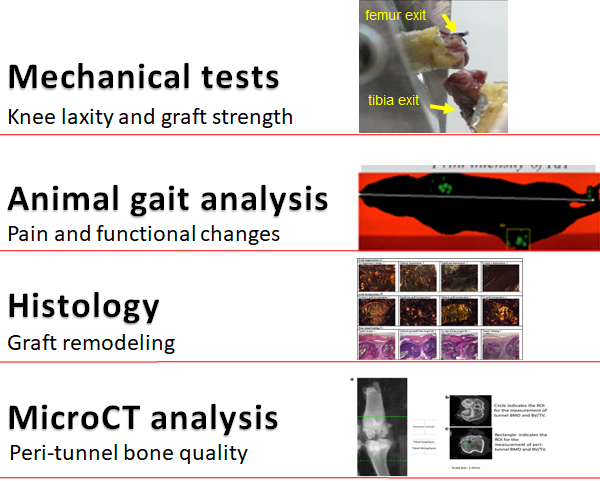 Practical Guides for Bone External Technology. Xia He-Tao(Editor). 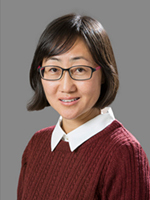 Peng Ai-Min, Liu Li-Min; Li Gang and Qin Si-He (Associate Editor). People's Medical Publishing House, Beijing, PR China, 2013 (ISBN 978-7-117-17408-4). Lan X, Zhang LH, TP, Xia HT, Li G, Peng AM, Han YL, Yuan BT, Xu, WP. S-osteotomy with lengthening and then nailing compared with traditional Ilizarov method. International Orthopaedics, 2013; 37(10):1995-2000. 李刚， 夏和桃。 应力与骨组织再生的生物学和生物力学基础。 中华创伤骨科杂志, 2013；15(10): 871-875. 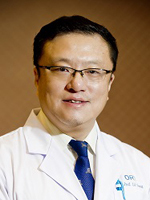 Wang Y, Ni M, Tang PF, Li G. Novel application of HA-TCP biomaterials in distraction osteogenesis shortened the lengthening time and promoted bone consolidation. Journal of Orthopaedic Research, 2009; 27:477-482. LI G, Tang PF. Update distraction osteogenesis/histogenesis. Journal of Japanese Pediatric Orthopaedic Association, 2008; 17 (2): 381-289. Pathogenesis of osteoarthritis (OA) is primarily associated with aging (degeneration) and trauma. Chondral lesion is difficult to heal due to chronic inflammation and unfavorable mechanical stress in the joint. We focus on new strategies to apply stem cell therapy for OA.